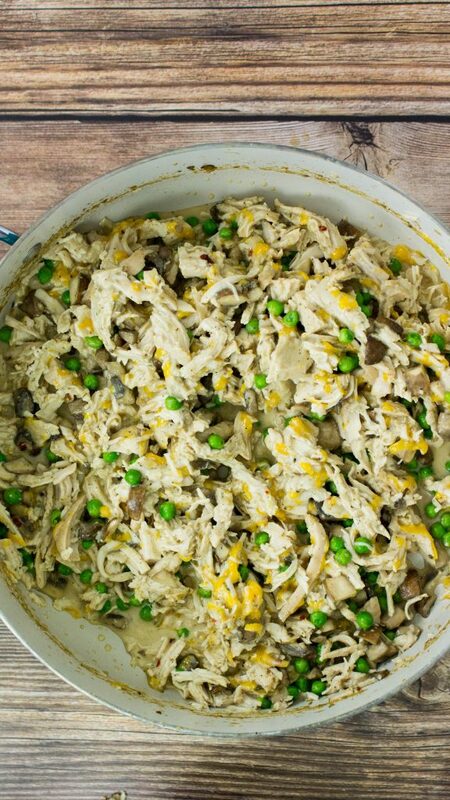 Turkey Noodle Casserole is delicious shredded turkey mixed with homemade cream of mushroom, peas, cheese, and egg noodles. Weight Watchers friendly- 6 SmartPoints! Casseroles are one of my favorite things to make and to eat. I remember as a kid my mom would always make casseroles and one of my favorites was tuna noodle casserole. 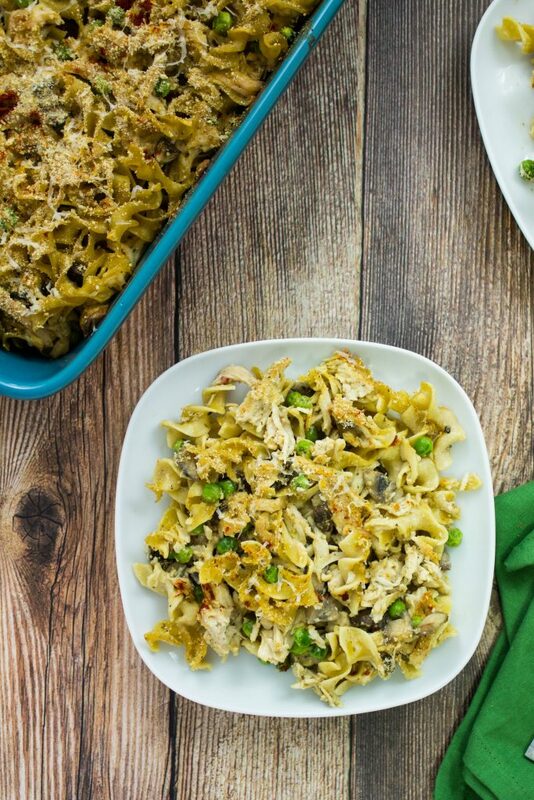 Delicious tuna mixed with cream of mushroom, egg noodles, and peas. Oh, and cheese! 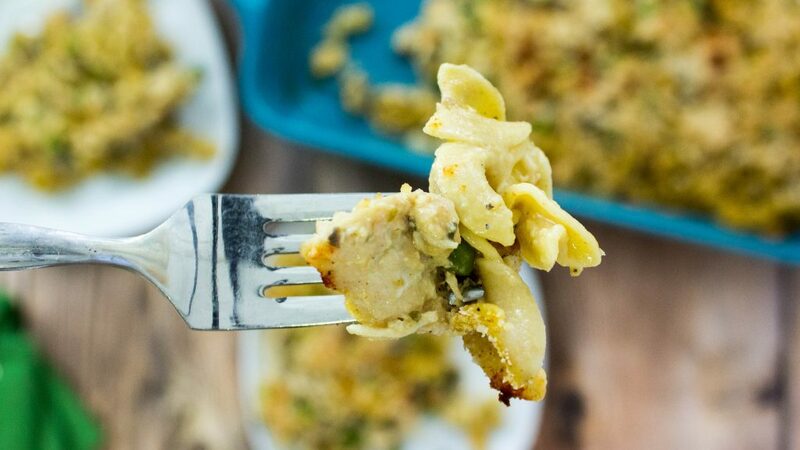 My Turkey Noodle Casserole is my healthy take on the classic casserole dish. 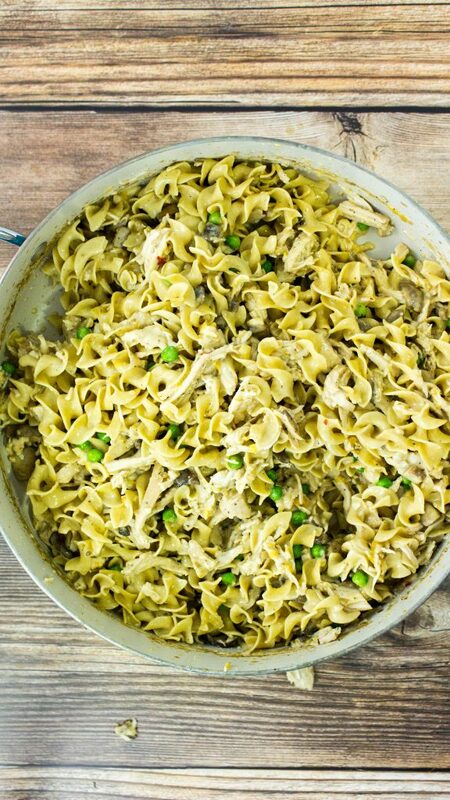 Delicious shredded turkey mixed with homemade cream of mushroom, peas, cheese, and egg noodles. This is a Weight Watcher friendly recipe and each serving is 6 SmartPoints. 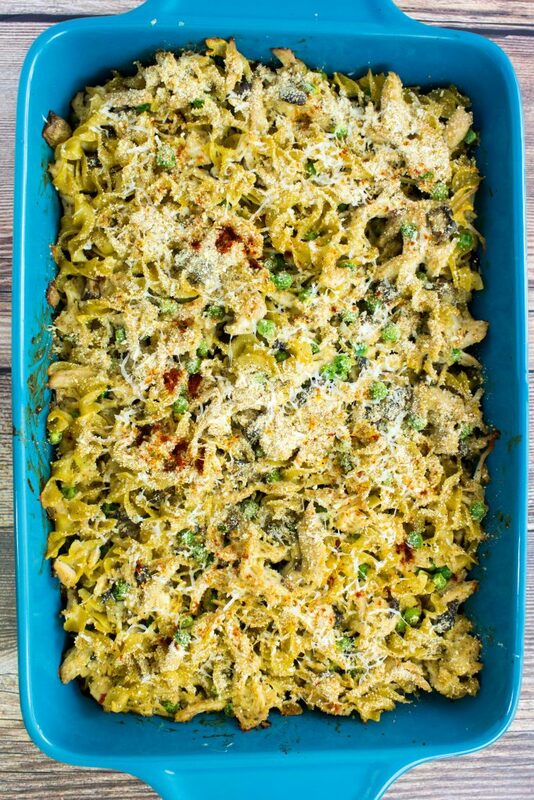 Tuna Noodle Casserole is probably one of my favorite casseroles of all time…. Seriously! I’m pretty sure everyone grew up eating this dish and I love to hear other people’s variations of the classic casserole. My mom’s version has a layer of wavy potato chips and a nice coating of cheese on top, which let’s be honest, is the best part of the whole meal! You might have learned by now, that I love turning classic recipes into a healthy and unique version. Instead of using tuna, for this recipe I use turkey tenderloins. I love cooking with turkey and turkey tenderloins are just like chicken breast. After they roast, you can shred them up just like shredded chicken! Another variation to the classic recipe is the canned cream of mushroom soup. I always prefer to make my own sauces and use as little preservatives as possible. Instead of canned cream of mushroom, my recipe calls for fresh baby bella mushrooms along with evaporated milk. The recipe starts with turkey tenderloins. You can find these in the turkey section in the meat area of your grocery store. Turkey tenderloins look just like chicken breast. I love cooking with them because they are moist and full of delicious flavor! Just roast the tenderloins in a casserole dish at 325 for 1 hour. You could easily do this step way ahead of time (even during your Sunday meal prep)! Once the turkey has cooled, shred with two forks and set aside. Heat a large skillet over medium heat and melt butter. Add diced baby bella mushrooms and sauté for about 8 minutes or so, until the mushrooms have sweat out all their liquid. 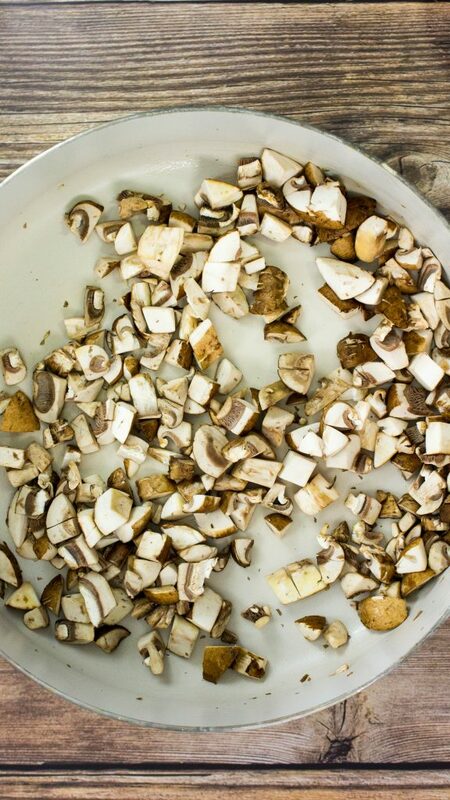 This recipe does not call for canned cream of mushroom, so you get to make your own sauce! 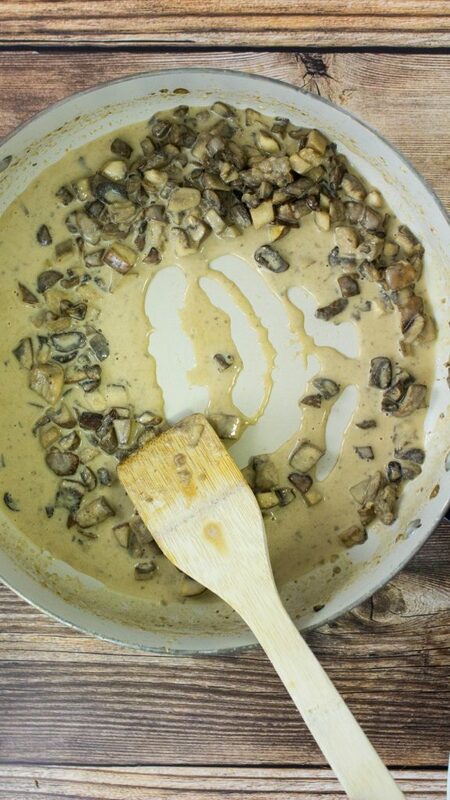 To make the sauce, just add white whole wheat flour to the mushrooms, then slowly add evaporated milk and vegetable broth, whisking and stirring constantly to break up the clumps. Add frozen peas and seasonings to the mushrooms and cook for a few minutes. Next add the shredded turkey and sharp cheddar and cook for about 10 minutes to let the cheese melt. Remove the skillet from heat and pour cooked whole grain egg noodles into the skillet and mix everything together! The final step is to pour the mixture into a casserole dish and sprinkle the top with breadcrumbs and smoked paprika. Bake for 25 minutes and it’s ready to devour! Not only is this recipe healthy, it’s so delicious. Once you try turkey instead of tuna… you won’t look back! The turkey cooked perfectly and it’s super tender. 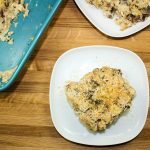 If you ask my husband, he’d tell you that he could totally eat the whole casserole in one night because IT’S THAT GOOD y’all! Healthy, full of flavor, and great to feed a crowd. Turkey Noodle Casserole is my healthy take on the classic casserole dish. Delicious shredded turkey mixed with homemade cream of mushroom, peas, cheese, and egg noodles. 6 Weight Watchers SmartPoints per serving! Spray casserole dish with cooking spray and place turkey tenderloins in an even layer in dish. Roast turkey tenderloins for 1 hour. 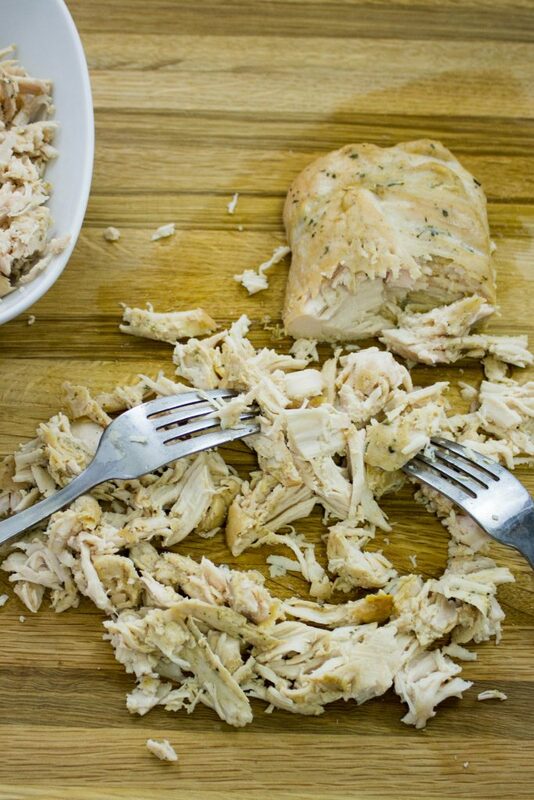 Once cooled enough to handle, shred turkey with two forks. Cook the egg noodles according to the package instructions. Set noodles aside when cooked. In a skillet over medium heat, melt butter, add mushrooms and cook for 7-10 minutes until mushrooms have cooked. Add flour and stir vigorously for 2 minutes. Slowly whisk in chicken broth and milk until well combined to create a roux. Bring to a boil to thicken sauce and cook for 2 minutes. Add frozen peas, oregano, salt, pepper, and red pepper flakes and cook for a few minutes. Add shredded cheese and shredded turkey and simmer for 10 minutes. Remove from heat and add noodles. Stir until well combined. Pour mixture into a casserole dish, top with breadcrumbs and sprinkle with paprika. May 12, 2017 at 11:53 am I hope you do try it Jobie :)! 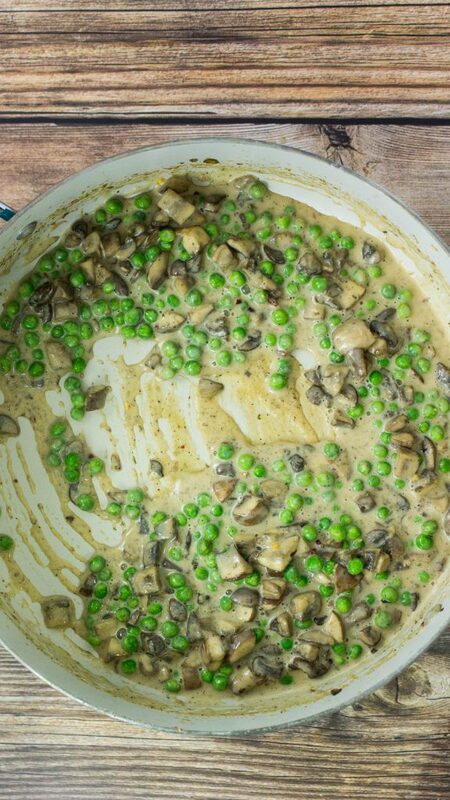 May 10, 2017 at 6:28 pm I love the idea of making this casserole with turkey and homemade mushroom sauce! May 10, 2017 at 7:38 pm Wow, this looks delicious and pretty easy to make. I'm always on the look out for healthy recipes. Thanks for sharing. May 12, 2017 at 11:52 am Yes, it's delicious and totally easy to make :) Thanks Brenda! May 10, 2017 at 7:44 pm Yum! I love making a big casserole at the beginning of the week! May 12, 2017 at 11:52 am Me too! 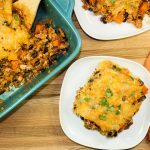 Such a time saver and great for leftovers for the week. Thanks Annie! May 11, 2017 at 7:24 am This looks so good! 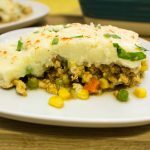 We could even do this with leftover turkey from big turkey (we have 6 kids so cook those more often than just thanksgiving lol!) I pinned this for a dinner recipe! May 12, 2017 at 11:48 am Exactly!! Thanks Candy! 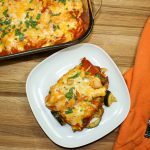 May 11, 2017 at 10:51 am Great earthy flavors in this dish! May 12, 2017 at 11:47 am Thanks Kristin! May 11, 2017 at 11:16 am That looks really good! Looks like something that would be great to have left overs for lunch the next too. May 12, 2017 at 2:38 am This looks tasty! I will have to add it to my meal plan for this week! Yum! Thank you for sharing this tasty looking Casserole! I love the use of mushrooms in it! May 12, 2017 at 11:46 am I love anything with mushrooms :) Thank you Amanda! May 12, 2017 at 11:45 am Yes, turkey tenderloins are perfect in some dishes instead of ground turkey! Just like shredded chicken. Thank you for pinning Karyl! May 12, 2017 at 9:41 pm This looks so delicious, I bet it makes the entire house smell great too. May 16, 2017 at 7:59 pm Oh wow, that sauce looks SO good! Way better than the canned stuff we used when I was growing up ;) Looking forward to trying this out! May 18, 2017 at 1:47 pm Yes totally Megan! Thanks so much.